Yet I never titled one that way, until now. I do try to keep things simple. In art and life, that’s always easier said than done. I would guess its from somewhere from Creek Rd. and shows Neshobe Island and Ceadr Man. Rd. jutting out on the left. Were you painting near the Green Dump Peter? It is quite lovely and serene as the lake can be when the season changes to quieter times. I would guess its from somewhere from Creek Rd. and shows Neshobe Island and Cedar Mtn. Rd. jutting out on the left. Were you painting near the Green Dump Peter? It is quite lovely and serene as the lake can be when the season changes to quieter times. Yes Bernard, this is from Crystal Beach looking south. Lake House would be over to the left there. I’ve always enjoyed the beauty of Lake Bomoseen and spent time there for many summers as a child at a friends camp. Your painting brings back fond memories! This is my husbands boat. I love this and will definitely be purchasing! How wonderful to see his boat in this lovely picture. Thanks Linda, print is on the way! Such a pretty lake! I’ve been there many times on picnics. Also my husband bought his pontoon boat at the store there and we took it out many times. what a way to spend a summer or autumn day! Beautiful! thank you Peter! I’ve spent many happy summer and autumn days there, boating and picnicking! This is perfect! 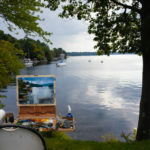 The simplicity of the painting portrays Lake Bomoseens beauty. 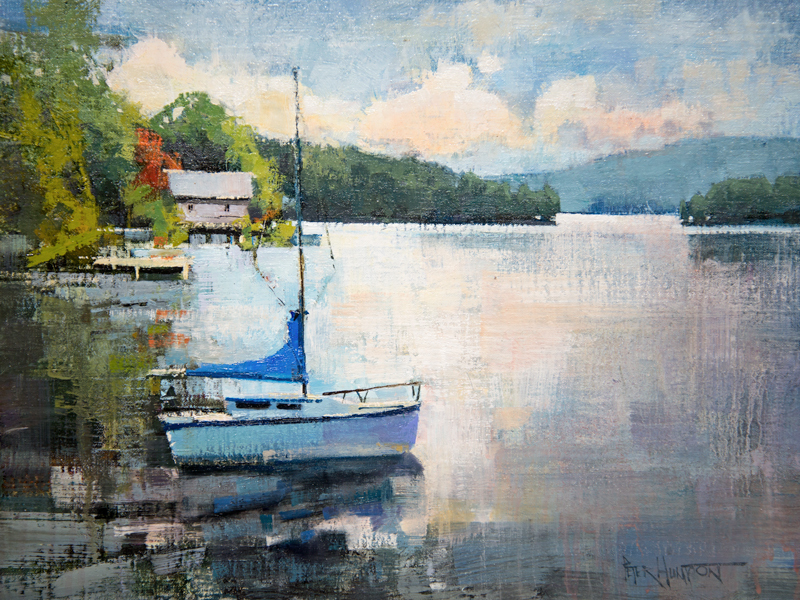 This painting is the essencence of the calm, relaxing, serenity of the lake. The very reason the lake is loved. Beautiful, peaceful picture after the busy summer. Love it! Beautiful! I want to visit there next summer! Essence of Bomoseen at season’s end. Serenity, tranquility, fragile beauty. This just became one of my favorites…. 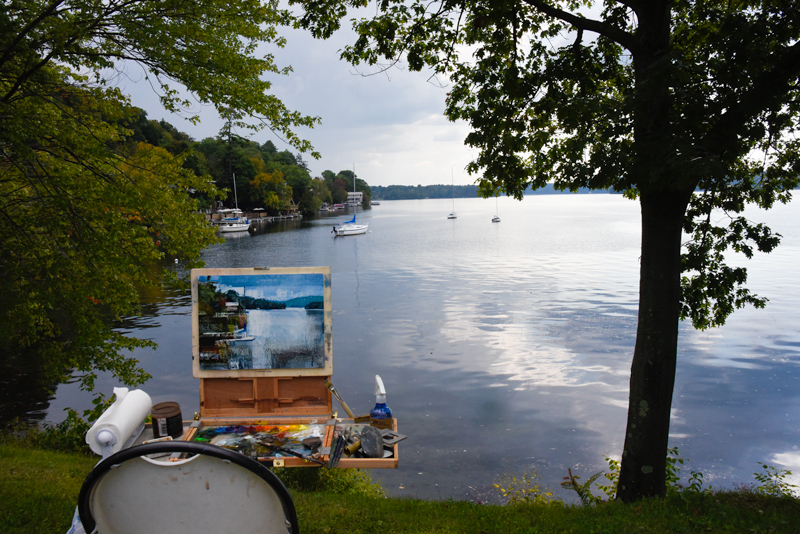 Once could experience all the reasons we go to the lake–to any beautiful lake–vicariously through this painting. Quite an accomplishment, Peter! Matisse would agree with Thoreau…to simplify. You always get me thinking, which is a good thing! This painting makes my heart and soul and body relax. Love it. And thank you for reminding me to Simplify. In a business like ours, we’re so consumed with the details. Brings back many happy memories. Spent some time here every summer with my Grandparents. Spent many a summer day with my husband and children on Lake Bomoseen. Peter this picture brings many fond memories to mind. Your paintings are such heartfelt creations. Brings back a wonderful past! I once read that simplicity inevitably brings one closest to the core of truth. True or not, it certainly serves well in a work of art, as it draws the viewer into that special realm where his own story and that of the artist merge into a new wholeness. Thanks Brian. Agreed. Of all my failed paintings, of which there have been many, a common thread among them would be “too complex” or “not simple enough”.